Handbook of Human Motion, Editors: Bertram Muller, Sebastian I. Wolf, Gert-Peter Bruggemann, Zhigang Deng, Andrew S. McIntosh, Freeman Miller, W. Scott Selbie, Springer Press, April 2018, total 3 volumes, 2500+ pages. Proceeding of ACM SIGGRAPH/Eurographics Symposium on Computer Animation (SCA) 2015, Editors: Jernej Barbic, Zhigang Deng, Stelian Coros, and Florence Bertails-Descoubes, ACM Press, August 2015. Advances in Visual Computing (Proceeding of International Symposium on Visual Computing 2014), Editors: George Bebis, Richard Boyle, Bahram Parvin, Darko Koracin, Ryan McMahan, Jason Jerald, Hui Zhang, Steven M. Drucker, Chandra Kambhamettu, Maha El Choubassi, Zhigang Deng, Springer Press, Dec 2014. Expressive Talking Avatar Synthesis and Animation, Guest Editors: Lei Xie, Jia Jia, Helen Meng, Zhigang Deng, and Lijun Wang, Multimedia Tools and Applications (MTAP), Springer Press, January 2015. Multimodal Joint Information Processing in Human Machine Interaction: Recent Advances, Guest Editors: Lei Xie, Zhigang Deng, and Stephen Cox, Multimedia Tools and Applications (MTAP), Springer Press, Nov 2013. Data-Driven 3D Facial Animation, Editors: Zhigang Deng, Ulrich Neumann, Spring-Verlag Press, October 2007. [*] denotes students supervised by Z. Deng. • Screwing Assembly Oriented Interactive Model Segmentation in HMD VR Environment, Xiaoqiang Zhu, Lei Song, Nan Wang, Ruiheng Zhang, Shenshuai Chen, Xiangyang Wang, Mengyao Zhu, Lihua You, Zhigang Deng, and Xiaogang Jin, Computer Animation and Virtual Worlds Journal (CAVW), special issue for CASA'19, (accepted in April 2019). • Shape-constrained Flying Insects Animation, Qiang Chen, Guoliang Luo, Yang Tong, Xiaogang Jin, and Zhigang Deng, Computer Animation and Virtual Worlds Journal (CAVW), special issue for CASA'19, (accepted in April 2019). • Crowd Behavior Simulation with Emotional Contagion in Unexpected Multi-hazard Situations, Mingliang Xu, Xiaozheng Xie, Pei Lv, Hua Wang, Yibo Guo, Zhigang Deng, and Bing Zhou, IEEE Transactions on Systems, Man, and Cybernetics: Systems (TSMC), (accepted in Feb 2019). • A Deep Learning-based Framework for Intersectional Traffic Simulation and Editing, Huikun Bi*, Tianlu Mao, Zhaoqi Wang, and Zhigang Deng, IEEE Transactions on Visualization and Computer Graphics (TVCG), (accepted in December 2018). • Motion-aware Compression and Transmission of Mesh Animation Sequences, Bailin Yang, Luhong Zhang, Frederick Li, Xiaoheng Jiang, Zhigang Deng, Meng Wang, and Mingliang Xu, ACM Transactions on Intelligent Systems and Technology (TIST), (accepted in December 2018). • Efficient and Realistic Character Animation through Analytical Physics-based Skin Deformation, Shaojun Bian, Zhigang Deng, Ehtzaz Chaudhry, Lihua You, Xiaosong Yang, Lei Guo, Hassan Ugail, Xiaogang Jin, Zhidong Xiao, and Jian Jun Zhang, Graphical Models (GM)(CVM'19 Special Issue), Elsevier, (conditionally accepted in November 2018)..
• Inter-session Reliability and Within-session Stability of a Novel Perception-Action Coupling Task, Chris Connaboy, Caleb D. Johnson, Alice D. LaGoy, Gert-Jan Pepping, Ricard J. Simpson, Zhigang Deng, Luming Ma*, Joanne L. Bower, Shawn R. Eagle, Shawn D. Flanagan, Candice A. Alfano, Aerospace Medicine and Human Performance (AMHP), Volume 90, Number 2, Feb 2019, (in press). • Biologically Inspired Ant Colony Simulation, Wei Xiang, Jiaping Ren, Kuan Wang, Zhigang Deng, and Xiaogang Jin, Computer Animation and Virtual Worlds (CAVW), (accepted in October 2018). • Real-time Facial Expression Transformation for Monocular RGB Video, Luming Ma, and Zhigang Deng, Computer Graphics Forum (CGF), (accepted in September 2018). • Dictionary-based Fidelity Measure for Virtual Traffic, Qianwen Chao, Zhigang Deng, Yangxi Xiao, Bangdun He, Qiguang Miao, and Xiaogang Jin, IEEE Transactions on Visualization and Computer Graphics (TVCG), (accepted in September 2018). • Online Global Non-rigid Registration for 3D Object Reconstruction Using Consumer-level Depth Cameras, Jiamin Xu, Weiwei Xu, Yin Yang, Zhigang Deng, and Hujun Bao, Computer Graphics Forum (CGF) , Special Issue for Pacific Graphics 2018, Oct 2018. (to appear). • Variational Mannequin Approximation Using Spheres and Capsules, Nannan Wu, Dongliang Zhang, Zhigang Deng, and Xiaogang Jin, IEEE Access, 2018, volume 6, pp. 25921-25929. • Sketch-based Shape-preserving Tree Animations, Yutong Wang, Luyuan Wang, Zhigang Deng, and Xiaogang Jin, Computer Animation and Virtual Worlds Journal, Special Issue for CASA'18, 29(3-4), May/August 2018, e1821. • A Fast Garment Fitting Algorithm Using Skeleton based Error Metric, Nannan Wu, Zhigang Deng, Dongliang Zhang, and Xiaogang Jin, Computer Animation and Virtual Worlds Journal, Special Issue for CASA'18, 29(3-4), May/August 2018, e1811. • Low-level Characterization of Expressive Head Motion through Frequency Domain Analysis, Yu Ding*, Lei Shi*, and Zhigang Deng, IEEE Transactions on Affective Computing (TAC), (accepted in Feb 2018). • Photorealistic Avatar and Teen Physical Activity: Feasibility and Preliminary Efficacy, Deborah Thompson, Dora Cantu, Chishinga Callender, Yan Liu, Madhur Rajendran*, Mayur Rajendran*, Yuting Zhang*, and Zhigang Deng, Games for Health Journal (GFH), Mary Ann Liebert, Inc. publisher, Volume 7, Number 2, April 2018, pp. 143-150. • Robust Structure Simplification for Hex Re-meshing, Xifeng Gao*, Daniele Panozzo, Wenping Wang, Zhigang Deng, and Guoning Chen, ACM Transactions on Graphics (Proceeding of ACM SIGGRAPH Asia 2017 Conference Papers), 36(6), November 2017, Article 185, 13 pages. • Shadow Traffic: A Unified Model for Abnormal Traffic Behavior Simulation, Hua Wang, Mingliang Xu, Fubao Zhu, Zhigang Deng, Yafei Li, and Bin Zhou, Computer & Graphics (C&G), Special issue for CAD/Graphics'17, Volume 70, Feb 2018, pp. 235-241. • Rigging and Fabricating Creative Characters, Xuekun Guo, Hao Chen, Tian Qiu, Juncong Lin, Zhigang Deng, Yangxi Xiao, and Xiaogang Jin, Journal of Computer Aided Design and Computer Graphics (CAD&CG), 29(7), July 2017, pp. 1177-1185. • Evaluating Hex-mesh Quality Metrics via Correlation Analysis, Xifeng Gao*, Jin Huang, Kaoji Xu, Derong Pan, Zhigang Deng, and Guoning Chen, Computer Graphics Forum (CGF), Special issue for SGP'17, 36(5), August 2017, pp. 105-116 . • Topologically Consistent Leafy Tree Morphing, Yutong Wang, Xiaowei Yue, Xiaogang Jin, and Zhigang Deng, Computer Animation and Virtual Worlds (CAVW), Special issue for CASA'17, 28(3-4), May/August 2017, 13 pages, e1761. • Hexahedral Meshing with Varying Element Sizes, Kaoji Xu, Xifeng Gao*, Zhigang Deng, and Guoning Chen, Computer Graphics Forum (CGF), 36(8), December 2017, pp. 540-553. • Realistic Data-Driven Traffic Flow Animation using Texture Synthesis, Qianwen Chao, Zhigang Deng, Jiaping Ren, Qianqian Ye, and Xiaogang Jin, IEEE Transactions on Visualization and Computer Graphics (TVCG), 24(2), Feb 2018, pp. 1167-1178. • Creative Virtual Tree Modeling through Hierarchical Topology-preserving Blending, Yutong Wang, Xiaowei Yue, Xiaogang Jin, and Zhigang Deng, IEEE Transactions on Visualization and Computer Graphics (TVCG), 23(12), Dec 2017, pp. 2521-2534. • An Efficient Approach for Feature-preserving Mesh Denoising, Xuequan Lu, Xiaohong Liu, Zhigang Deng, and Wenzi Chen, Optics and Lasers in Engineering (OLEN), Elsevier Press, Volume 90, March 2017, pp. 186-195. • Development of A Teen-Focused Exergame, Deborah Thompson, Dora Cantu, Madhur Rajendran*, Mayur Rajendran*, Tanay Bhargava*, Yuting Zhang*, Cheng Chen*, Yan Liu, and Zhigang Deng, Games for Health Journal (GFH), 5(5), Oct 2016, pp. 342-356. • Interactive Mechanism Modeling from Multi-view Images, Mingliang Xu, Mingyuan Li, Weiwei Xu, Zhigang Deng, Yin Yang, and Kun Zhou, ACM Transactions on Graphics (Proceeding of ACM SIGGRAPH Asia 2016 Conference Papers), 35(6), Nov 2016, article 236, pages 236:1 - 236:13. • A Robust Scheme for Feature-Preserving Mesh Denoising, Xuequan Lu, Zhigang Deng, and Wenzi Chen, IEEE Transactions on Visualization and Computer Graphics (TVCG), 22(3), March 2016, pp. 1181-1194. • Structured Volume Decomposition via Generalized Sweeping, Xifeng Gao*, Tobias Martin, Sai Deng, Elaine Cohen, Zhigang Deng, and Guoning Chen, IEEE Transactions on Visualization and Computer Graphics (TVCG), 22(7), July 2016, pp. 1899-1911. • A Practical Model for Live Speech Driven Lip-Sync, Li Wei* and Zhigang Deng, IEEE Computer Graphics and Applications (CG&A), 35(2), March/April 2015, pp. 50-58. • Hexahedral Mesh Re-parameterization from Aligned Base Domains, Xifeng Gao*, Zhigang Deng, and Guoning Chen, ACM Transactions on Graphics (Proceeding of ACM SIGGRAPH 2015 Papers), 34(4), July 2015, pp. 142: 1- 142:10. • GPU-based Polygonization and Optimization for Implicit Surfaces, Junjie Chen, Xiaogang Jin, and Zhigang Deng, The Visual Computer (TVC), 31(2), Feb 2015, pp. 119-130. • Collective Crowd Formation Transform with Mutual Information based Runtime Feedback, Mingliang Xu, Yunpeng Wu, Yangdong Ye, Illes Farkas, Hao Jiang, and Zhigang Deng, Computer Graphics Forum (CGF), 34(1), 2015, pp. 60-73. • Vehicle-Pedestrian Interaction for Mixed Traffic Simulation,Qianwen Chao, Zhigang Deng, and Xiaogang Jin, Computer Animation and Virtual Worlds Journal (CAVW), Special Issue for CASA'15, 26(3-4), 2015, pp. 405-412. • An Efficient Lane Model for Complex Traffic Simulation, Tianlu Mao, Hua Wang, Zhigang Deng, and Zhaoqi Wang, Computer Animation and Virtual Worlds Journal (CAVW), Special Issue for CASA'15, 26(3-4), 2015, pp. 397-403 . • Spectral Animation Compression,Yang Liu, Chao Wang, Xiaohu Guo, Zichun Zhong, Binh H. Le*, and Zhigang Deng, Journal of Computer Science and Technology (JCST), Special Issue for CVM'15, 30(3), May 2015, pp. 540-552, Springer press. • Robust and Accurate Skeletal Rigging from Mesh Sequences, Binh H. Le* and Zhigang Deng, ACM Transactions on Graphics (Proceeding of ACM SIGGRAPH 2014 Papers), 33(4), July 2014, pp. 84:1 - 84:10. • Crowd Simulation and Its Applications: Recent Advances, Mingliang Xu, Hao Jiang, Xiaogang Jin, and Zhigang Deng, Journal of Computer Science and Technology (JCST), Springer Press, 29(5), September 2014, pp. 740-750. • Inherent Noise-Aware Insect Swarm Simulation, Xinjie Wang, Xiaogang Jin, Zhigang Deng, and Linling Zhou, Computer Graphics Forum (CGF), 33(6), September 2014, pp. 51-62. • GPU-Accelerated Interactive Visualization and Planning of Neurosurgical Interventions, Mario Rincon*, Nikhil V. Navkar*, Nikos V. Tsekos, and Zhigang Deng, IEEE Computer Graphics and Applications (CG&A), January/Feb 2014, pp. 14-23. • Flock Morphing Animation, Xinjie Wang, Linling Zhou, Zhigang Deng, and Xiaogang Jin, Computer Animation and Virtual Worlds Journal (CAVW), CASA 2014 special issue, 25(3-4), May-August 2014, pp. 353-362. • A Personality Model for Animating Heterogeneous Traffic Behaviors, Xuequan Lu, Mingliang Xu, Wenzhi Chen, Zonghui Wang, and Zhigang Deng, Computer Animation and Virtual Worlds Journal (CAVW), CASA 2014 special issue, 25(3-4), May-August 2014, pp. 363-373. • AA-FVDM: An Accident-Avoidance Full Velocity Difference Model for Animating Realistic Street-Level Traffic in Rural Scenes, Xuequan Lu, Wenzhi Chen, Mingliang Xu, Zonghui Wang, Zhigang Deng, and Yangdong Ye, Computer Animation and Virtual Worlds Journal (CAVW), 25(1), 2014, pp. 85-97. • Less-talk-is-more-play: An Experimental Study on Multiplayer Mobile Games for Casual Gamers, Chrysanthi C. Ntina*, Xiaohan Ma*, and Zhigang Deng, ACM Computer In Entertainment (CIE), Dec 2014, 11(3), Article 3, 16 pages. • Generating Freestyle Group Formation in Agent-based Crowd Simulation, Qin Gu* and Zhigang Deng, IEEE Computer Graphics and Applications (CG&A), 33(1), Jan/Feb 2013, pp. 14-25. • A Text-Driven Conversational Avatar Interface for Instant Messaging on Mobile Devices, Mario Rincon* and Zhigang Deng, IEEE Transactions on Human-Machine Systems (THMS), 43(3), May 2013, pp. 328-332. • Characterizing the Performance and Power Consumption of 3D Mobile Games, Xiaohan Ma*, Zhigang Deng, Mian Dong, and Lin Zhong, IEEE Computer, 46(4), April 2013, pp. 72-78. • A Framework for Integrating real-time MRI with Robot Control: Application to Simulated Transapical Cardiac Interventions, Nikhil Navkar*, Zhigang Deng, Dipan J. Shah, and Nikos V. Tsekos, IEEE Transactions on Biomedical Engineering (TBME), (special issue on surgical robotics), April 2013, 60(4), pp. 1023-1033. • Smooth Skinning Decomposition with Rigid Bones, Binh H. Le* and Zhigang Deng, ACM Transactions on Graphics (Proceeding of ACM SIGGRAPH Asia 2012 Papers), 31(6), Article 199, Nov 2012, 199:1-199:10. • Live Speech Driven Head-and-Eye Motion Generators, Binh H. Le*, Xiaohan Ma* and Zhigang Deng, IEEE Transactions on Visualization and Computer Graphics (TVCG), 18(11), Nov 2012, pp. 1902-1914. • A Surface-based 3D Dendritic Spine Detection Approach from Confocal Microscopy Images, Qing Li* and Zhigang Deng, IEEE Transactions on Image Processing (TIP), March 2012, 21(3), pp. 1223-1230. • A Statistical Quality Model for Data-Driven Speech Animation, Xiaohan Ma* and Zhigang Deng, IEEE Transactions on Visualization and Computer Graphics (TVCG), 18(11), Nov 2012, pp. 1915-1927. • A Robust High Capacity Affine-Transformation-Invariant Scheme for Watermarking 3D Geometric Models, Xifeng Gao*, Caiming Zhang, Yan Huang, and Zhigang Deng, ACM Transactions on Multimedia Computing, Communications and Applications (TOMM), volume 8, number 2S, Article 34, pages 1-21, September 2012. • A Global Spatial Similarity Optimization Scheme to Track Large Numbers of Dendritic Spines in Time-lapse Confocal Microscopy, Qing Li*, Zhigang Deng, Yong Zhang, Xiaobo Zhou, U. Valentin Nagerl, and Stephen TC Wong, IEEE Transactions on Medical Imaging (TMI), 30(3), March 2011, pp. 632-641. • Context-Aware Motion Diversification for Crowd Simulation, Qin Gu* and Zhigang Deng, IEEE Computer Graphics and Applications (CG&A), Sept/Oct 2011, pp. 54-65. • Image-based Face Illumination Transferring using Logarithmic Total Variation Models, Qing Li*, Wotao Yin, Zhigang Deng, The Visual Computer (TVC), Jan 2010, 26(1), pp. 41-49. • Compression of Human Motion Capture Data using Motion Pattern Indexing, Qin Gu*, Jingliang Peng, Zhigang Deng, Computer Graphics Forum (CGF), 28(1), 2009, pp. 1-12. • Can Local Avatars Satisfy Global Audience? A Case Study of High-Fidelity 3D Facial Avatar Animation in Subject Identification and Emotion Perception by US and International Groups, Chang Yun*, Zhigang Deng, Merrill Hiscock, ACM Computer In Entertainment (CIE), 7(2), Apri-June 2009, pp. 1-26. • Orthogonal Blendshape based Editing System for Facial Motion Capture Data, Qing Li*, Zhigang Deng, IEEE Computer Graphics and Applications (CG&A), 28(6), Nov/Dec 2008, pp. 76-82. • Expressive Speech Animation Synthesis with Phoneme-Level Controls, Zhigang Deng, Ulrich Neumann, Computer Graphics Forum (CGF), 27(8), 2008, pp. 2096-2113. • Online Motion Capture Marker Labeling for Multiple Interacting Articulated Targets, Qian Yu, Qing Li*, Zhigang Deng, Computer Graphics Forum (Proc. of Eurographics 2007), 26(3), 2007, pp. 477-483. • Rigid Head Motion in Expressive Facial Animation: Analysis and Synthesis, Carlos Busso, Zhigang Deng, Michael Grimm, Ulrich Neumann, Shrikanth Narayanan, IEEE Transactions on Audio, Speech and Language Processing (TASLP), 15(3), March 2007, pp. 1075-1086. • Expressive Facial Animation Synthesis by Learning Speech Co-Articulation and Expression Spaces, Zhigang Deng, Ulrich Neumann, J.P. Lewis, Tae-Yong Kim, Murtaza Bulut, Shri Narayanan, IEEE Transactions on Visualization and Computer Graphics (TVCG), 12(6), Nov/Dec 2006, pp. 1523-1534. • Automated Eye Motion using Texture Synthesis, Zhigang Deng, JP Lewis, Ulrich Neumann, IEEE Computer Graphics and Applications (CG&A), 25(2), March/April 2005, pp. 24-30. • Natural Head Motion Synthesis driven by Acoustic Prosodic Features, Carlos Busso, Zhigang Deng, Ulrich Neumann, Shri Narayanan, Computer Animation and Virtual Worlds (CAVW), 16(3-4), July 2005, pp. 283-290. • ODE-driven Sketch-based Character Modeling with Primitive Deormers and Shape Generators, Ouwen Lee, Zhigang Deng, Shaojun Bian, Ismail Kazmi, Xiaogang Jin, Lihua You, and Jian Jun Zhang, Proc. of Computer Graphics International (CGI) 2019, June 2019. (to appear). • 3D Mesh Animation Compression based on Adaptive Spatio-temporal Segmentation, Guoliang Luo, Zhigang Deng, Wei Zeng, Xin Zhao, Xiaogang Jin, Hyewon Seo, and Wenqiang Xie, Proc. of ACM SIGGRAPH Symposium on Interactive 3D Graphics and Games (SI3D) 2019, Montreal, Canada, May 2019, (to appear). • Real-Time Hierarchical Facial Performance Capture, Luming Ma*, and Zhigang Deng, Proc. of ACM SIGGRAPH Symposium on Interactive 3D Graphics and Games (SI3D) 2019, Montreal, Canada, May 2019, (to appear). • Blur Measurement for Partially Blurred Images with Saliency Constrained Global Refinement, Xianyong Fang, Qingqing Guo, Cheng Ding, Linbo Wang, and Zhigang Deng, Proc. of Pacific Rim Conference on Multimedia (PCM) 2018 , September 2018, Hefei, China, pp. 338-349. • An Emotion Evolution based Model for Group Behavior Simulation, Hao Jiang, Zhigang Deng, Mingliang Xu, Xiangjun He, Tianlu Mao, and Zhaoqi Wang, Proc. of ACM SIGGRAPH Symposium on Interactive 3D Graphics and Games 2018 (SI3D), May 2018, Montreal, Quebec, Canada, pp. 10:1-10:6. • Unsupervised Articulated Skeleton Learning from Point Set Sequences Captured by a Single Depth Camera, Xuequan Lu, Honghua Chen, Sai-Kit Yeung, Zhigang Deng, Wenzi Chen, Proc. of Thirty-Second AAAI Conference on Artificial Intelligence 2018 (AAAI-18), Feb 2018, New Orleans, LA, pp. 7226-7234. • Perceptual Enhancement of Emotional Mocap Head Motion: An Experimental Study, Yu Ding*, Lei Shi*, and Zhigang Deng, Proc. of International Conference on Affective Computing and Intelligent Interaction 2017 (ACII), Oct 2017, San Antonio, TX, pp. 242-247. • A Multifaceted Study on Eye Contact based Speaker Identification in Three-party Conversations, Yu Ding*, Yuting Zhang*, Meihua Xiao*, and Zhigang Deng, Proc. of ACM SIGCHI International Conference on Human Factors in Computing Systems 2017 (ACM CHI), May 2017, Denver, CO, pp. 3011-3021. • Interactive Cage Generation for Mesh Deformation, Binh H. Le*, and Zhigang Deng, Proc. of ACM SIGGRAPH Symposium on Interactive 3D Graphics and Games 2017 (SI3D), Feb 2017, San Francisco, CA, article 3, 9 pages, pages 3:1-3:9. • A Data-driven Model for Lane-changing in Traffic Simulation, Huikun Bi*, Tianlu Mao, Zhaoqi Wang, and Zhigang Deng, Proc. of ACM SIGGRAPH/Eurographics Symposium on Computer Animation 2016 (SCA), July 2016, Zurich, Switzerland, pp. 149-158. • A Multidisciplinary, Multifaceted Approach to Improve the Computer Science Based Game Design Education: Methodology and Assessment,Chang H. Yun, Hesam Panahi, and Zhigang Deng, Proceeding of the 47th ACM Technical Symposium on Computer Science Education (SIGCSE) 2016, Memphis, Tennessee, March 2016, pp. 570-575. • Skinning: Real-time Shape Deformation, Alec Jacobson, Zhigang Deng, Ladislav Kavan, and John P. Lewis, ACM SIGGRAPH 2014 Course Note, Vancouver, BC, Canada, August 2014, (95 pages). • Practice and Theory of Blendshape Facial Models, J.P. Lewis, Ken Anjyo, Taehyun Rhee, Mengjie Zhang, Fred Pighin, and Zhigang Deng, Proceedings of Eurographics State of The Art Papers (EG STAR) 2014, pp. 199-218, (20 pages). • An Evaluation of the Quality of Hexahedral Meshes via Modal Analysis, Xifeng Gao*, Jin Huang, Siwang Li, Zhigang Deng, and Guoning Chen, Proceeding of the CASA 2014 Workshop on Structured Meshing: Theory, Applications, and Evaluation, co-located with CASA 2014 conference, Houston, TX, May 26th, 2014. • Implementation of a Force-Feedback Interface for Fixed-Access Point Interventions with real time MRI guidance, Nick von Sternberg, Atilla Kilicarslan, Nikhil Navkar*, Zhigang Deng, Karolos Grigoriadis, and Nikos V. Tsekos, Proceedings of IEEE International Conference on Robotics and Automation (ICRA) 2013, Karlsruhe, Germany, May 2013, pp. 4869-4874. • Visual and Force-Feedback Guidance for Robot-Assisted Interventions in the Beating Heart with Real-Time MRI, Nikhil V. Navkar*, Zhigang Deng, Dipan J. Shah, Kostas Bekris, and Nikolaos V. Tsekos, Proc. 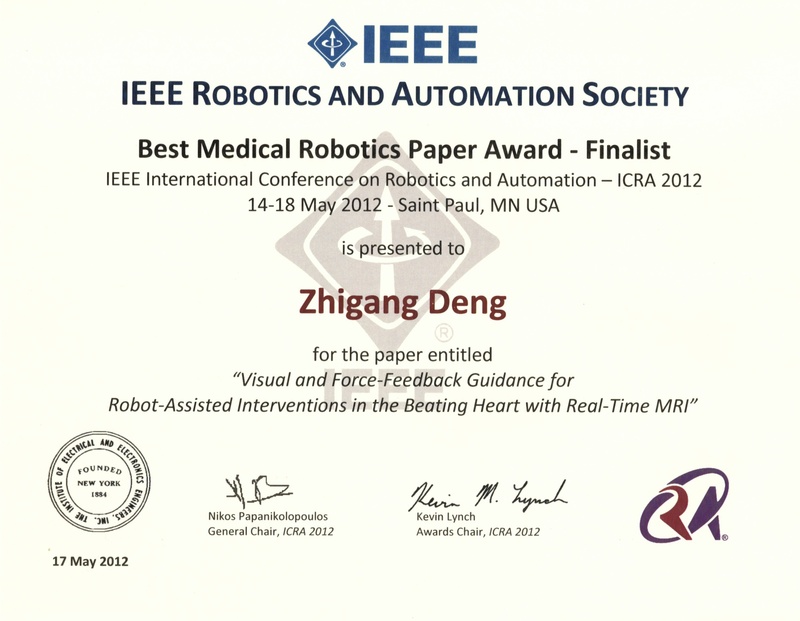 of IEEE International Conference on Robotics and Automation (ICRA) 2012, St Paul, MN, May 14-18, 2012, pp. 689-694. • Robot-Assisted Mechanical Scanning and Co-Registration of Magnetic Resonance Imaging and Light-Induced Flurescence, Ahmet E. Sonmez, William M. Spees, Alpay Ozcan, Zhigang Deng, Andrew Webb, and Nikolaos V. Tsekos, Proc. of Fourth IEEE RAS/EMBS International Conference on Biomedical Robotics and Biomechatronics (BioRob) 2012, Rome, Italy, June 24-28, 2012, pp. 775-780. • Intraoperative Registration of Preoperative 4D Cardiac Anatomy with real-time MR images, Xifeng Gao*, Nikhil V. Navkar*, Dipan J. Shah, Nikos V. Tsekos, and Zhigang Deng, Proc. of IEEE International Conference on BioInformatics and BioEngineering (BIBE) 2012, Larnaca, Cyprus, Nov 11-13, 2012, pp. 583-588. • Quaternion Space Sparse Decomposition for Motion Compression and Retrieval, Mingyang Zhu*, Huaijiang Sun, and Zhigang Deng, Proceeding of ACM SIGGRAPH/Eurographics Symposium on Computer Animation (SCA) 2012, Lausanne, Switzerland, July 2012, pp. 183-192. • Formation Sketching: An Approach to Stylize Groups in Crowd Simulation, Qin Gu* and Zhigang Deng, Proc. of Graphics Interface (GI) 2011 , St. John's, Newfoundland, Canada, May 2011, pp. 1-8. • Generation of 4D Access Corridors from Real-Time Multislice MRI for Guiding Transapical Aortic Valvuloplasties, Nikhil Navkar*, Erol Yeniaras, Dipan J. Shah, Nikolaos V. Tsekos, and Zhigang Deng. Proc. of International Conference on Medical Image Computing and Computer Assisted Intervention (MICCAI) 2011, Toronto, Canada, Sep 2011, pp. 251-258. • Magnetic Resonance Based Control of A Robotic Manipulator for Interventions in the Beating Heart, Erol yeniaras, Johann Lamaury, Nikhil Navkar*, Dipan J. Shah, Karen Chin, Zhigang Deng, Nikolaos Tsekos, Proc. of IEEE International Conference on Robotics and Automation (ICRA) 2011, Shanghai, China, May 2011, pp. 6270-6275. • Perceptual Analysis of Talking Avatar Head Movements: A Quantitative Perspective, Xiaohan Ma*, Binh H. Le*, and Zhigang Deng, Proc. of ACM SIGCHI International Conference on Human Factors in Computing Systems 2011 (ACM CHI), Vancouver, Canada, May 2011, pp. 2699-2702. • MR-based Real Time Path Planning for Cardiac Operations with Transapical Access, Erol Yeniaras, Nikhil Navkar*, Ahmet Sonmez, Dipan J. Shah, Zhigang Deng, and Nikolaos V. Tsekos. Proc. of International Conference on Medical Image Computing and Computer Assisted Intervention (MICCAI) 2011, Toronto, Canada, Sep 2011, pp. 25-32. • An approach for robot-assisted biosensing: Demonstration with MRI-guided MR spectroscopy, Ahmet E Sonmez, Yousef Hedayati, Andrew G Webb, Zhigang Deng, and Nikolaos V Tsekos. Proc. of 10th IEEE International Workshop on Biomedical Engineering (BIOENG) 2011, Kos, Greece, Oct 2011, pp. 1-4. • Extracting Geometric Features of Aortic-Valve Annulus Motion from Dynamic Cardiac MRI for Guiding Interventions, Nikhil Navkar*, Erol Yeniaras, Dipan J. Shah, Nikolaos V. Tsekos, and Zhigang Deng, Proceedings of IEEE International Symposium on Biomedical Imaging (ISBI) 2011, Chicago, IL, March 2011, pp. 1302-1305. • A Novel Virtual Reality Environment for Preoperative Planning and Simulation of Image Guided Intracardiac Surgeries with Robotic Manipulators, Erol Yeniaras, Zhigang Deng, Mushabbar A. Syed, Mark Davies, and Nikolaos V.Tsekos, in Proc. of Medicine Meets Virtual Reality 2011 Conference (MMVR), Long Beach, CA, Feb 2011, pp. 716-722. • Comparison of Reaching Kinematics during Mirror and Parallel Robotic Movements, Zahra Kadivar, Cynthia Sung, Zachary Thompson, Marcia O'Malley, Michael Liebschner, and Zhigang Deng, in Proc. of Medicine Meets Virtual Reality 2011 Conference(MMVR), Long Beach, CA, Feb 2011, pp. 247-253. • Perceiving Motion Transitions in Pedestrian Crowds, Qin Gu*, Chang Yun*, and Zhigang Deng, in Proc. of ACM Symposium on Virtual Reality Software and Technology (VRST) 2010, (short paper), Hong Kong, Dec 2010, pp. 199-202. • Crafting 3D Faces Using Free Form Portrait Sketching and Plausible Texture Inference, Tanasai Sucontphunt, Borom Tunwattanapong, Zhigang Deng, and Ulrich Neumann, in Proc. of Graphics Interface (GI) 2010, Ottawa, Ontario, Canada, May-June 2010, pp. 209-216. • Visualization and Planning of Neurosurgical Interventions with Straight Access, Nikhil Navkar*, Nikolaos Tsekos, Jason Stafford, Jeffery Weinberg, and Zhigang Deng, in Proc. of the 1st International Conference on Information Processing in Computer-Assisted Intervention (IPCAI) 2010, Geneva, Switzerland, June 2010, pp. 1-11. • Towards A New Cyber-Physical System for MRI-Guided and Robot-Assisted Cardiac Procedures, Eerol Yeniaras, J. Lamaury, Zhigang Deng, and Nikolaos V. Tsekos, in Proc. of IEEE International Conference on Information Technology and Applications in Biomedicine (ITAB) 2010, Corfu, Greece, Nov 2010, pp. 1-5. • PADS: Enhancing Gaming Experience Using Profile-Based Adaptive Difficulty System, Chang Yun*, Philip Trevino, William Holtkamp, and Zhigang Deng, in Proc. of ACM SIGGRAPH Symposium on Video Games (SandBox) 2010, Los Angeles, CA, July 2010, pp. 31-36. • Style Learning and Transferring for Facial Animation Editing, Xiaohan Ma*, Binh H. Le*, Zhigang Deng. in Proc. ACM SIGGRAPH/Eurographics Symposium on Computer Animation (SCA) 2009, New Orleans, LA, August 2009, pp. 114-123. • Perceptually Consistent Example-based Human Motion Retrieval, Zhigang Deng, Qin Gu*, Qing Li*, Proc. ACM SIGGRAPH Symposium on Interactive 3D Graphics and Games (SI3D) 2009, Boston, MA, Feb 2009, pp. 191-198. • Intermittency of Slow Arm Movements Increases in Distal Direction, Ozkan Celik, Qin Gu*, Zhigang Deng, Marcia O'Malley, in Proc. IEEE/RSJ International Conference on Intelligent Robots and Systems (IROS) 2009, St Louis, MO, Oct 2009, pp. 4499-4504. • A Novel Surface-based Geometric Approach for 3D Dentritic Spline Detection From Multi-Photon Excitation Microscopy Images, Qing Li*, Xiaobo Zhou, Zhigang Deng, Matthew Baron, Merilee A. Teylan, Yong Kim, Stephen T.C. Wong, Proc. IEEE International Symposium on Biomedical Imaging (ISBI) 2009, Boston, MA, June 2009, pp. 1255-1258. • Natural Eye Motion Synthesis by Modeling Gaze-Head Coupling, Xiaohan Ma*, Zhigang Deng, Proc. IEEE Virtual Reality (VR) 2009, Lafayette, LA, March 2009, pp. 143-150. • Crafting Personalized Facial Avatars Using Editable Portrait and Photograph Example, Tanasai Sucontphunt, Zhigang Deng, Ulrich Neumann, Proc. IEEE Virtual Reality (VR) 2009, Lafayette, LA, March 2009, pp. 259-260. • An Interactive Geometric Technique for Upper and Lower Teeth Segmentation, Binh H. Le*, Zhigang Deng, James Xia, Yu-Bing Chang, Xiaobo Zhou, in Proc. International Conference on Medical Image Computing and Computer Assisted Intervention (MICCAI) 2009, London, UK, Oct 2009, pp. 968-975. • Statistical Power Consumption Analysis and Modeling for GPU-based Computing, Xiaohan Ma*, Mian Dong, Lin Zhong, Zhigang Deng, in Proc. ACM SOSP Workshop on Power Aware Computing and Systems (HotPower) 2009, Big Sky, MT, October 2009. • O' Game, Can You Feel My Frustration? : Improving User's Gaming Experience via StressCam, Chang Yun*, Dvijesh Shastri, Ioannis Pavlidis, Zhigang Deng, Proc. ACM SIGCHI Conference on Human Factors in Computing Systems 2009 (ACM CHI), Boston, MA, April 2009, pp. 2195-2204. • Perceptually Guided Expressive Facial Animation, Zhigang Deng, Xiaohan Ma*, Proc. ACM SIGGRAPH/Eurographics Symposium on Computer Animation (SCA) 2008, Dublin, Ireland, June 2008, pp. 67-76. • Interactive 3D Facial Expression Posing through 2D Portrait Manipulation, Tanasai Sucontphunt*, Zhenyao Mo, Ulrich Neumann, Zhigang Deng, Proc. Graphics Interface (GI) 2008, Windsor, Ontario, Canada, May 2008, pp. 177-184. • A Novel Visual System for Expressive Facial Motion Data Exploration, Tanasai Sucontphunt*, Xiaoru Yuan, Qing Li, Zhigang Deng, Proc. IEEE Pacific Visualization Symposium (PacificVis) 2008, Kyoto, Japan, May 2008, pp. 103-110. • EduNET: A Prototype Educational System Based on Handwritten and Verbal Interaction for Individuals with Multiple Sclerosis, Chang H. Yun, Zhigang Deng, Olin Johnson, Oscar Criner, Proc. Rehabilitation Engineering & Assistive Technology Society of North America Annual Conference (RESNA) 2007, Phoenix, Arizona, June 2007. • eFASE: Expressive Facial Animation Synthesis and Editing with Phoneme-Isomap Controls, Zhigang Deng, Ulrich Neumann, Proc. ACM SIGGRAPH/Eurographics Symposium on Computer Animation (SCA) 2006, Vienna, Austria, Sep 2006, pp. 251-259. • Perceiving Visual Emotions with Speech, Zhigang Deng, Jeremy Bailenson, JP Lewis, Ulrich Neumann, Proc. International Conference on Intelligent Virtual Agents (IVA) 2006, Marina Del Rey, CA, August 2006, pp. 107-120. • Animating Blendshape Faces by Cross-Mapping Motion Capture Data, Zhigang Deng, Pei-Ying Chiang, Pamela Fox, Ulrich Neumann, Proc. ACM SIGGRAPH Symposium on Interactive 3D Graphics and Games (SI3D) 2006, Redwood City, CA, March 2006, pp. 43-48. • Reducing Blendshape Interference by Selected Motion Attenuation, JP Lewis, Jonathan Mooser, Zhigang Deng, Ulrich Neumann, Proc. ACM SIGGRAPH Symposium on Interactive 3D Graphics and Games SI3D) 2005, Washington DC, April 2005, pp. 25-29. • Synthesizing Speech Animation by Learning Compact Speech Co-Articulation Models, Zhigang Deng, JP Lewis, Ulrich Neumann, Proc. Computer Graphics International (CGI) 2005, Stony Brook, NY, June 2005, pp. 19-25. • Automatic Dynamic Expression Synthesis for Speech Animation, Zhigang Deng, Murtaza Bulut, Ulrich Neumann, Shri Narayanan, Proc. International Conference on Computer Animation and Social Agents (CASA) 2004, Geneva, Switzerland, July 2004, pp. 267-274. • Audio-based Head Motion Synthesis for Avatar-based Telepresence Systems, Zhigang Deng, Carlos Busso, Shri Narayanan, Ulrich Neumann, Proc. ACM SIGMM Workshop on Effective Telepresence (ETP) 2004, NYC, NY, Oct 2004, pp. 24-30. • Analysis of Emotion Recognition using Facial Expressions, Speech and Multimodal Information, Carlos Busso, Zhigang Deng, Serdar Yildirim, Murtaza Bulut, Chul Min Lee, Abe Kazemzadeh, Sungbok Lee, Ulrich Neumann, Shrikanth Narayanan, Proc. ACM International Conference on Multimodal Interface (ICMI) 2004, State College, PA, Oct 2004, pp. 205-211. • Acoustic Study of Emotions Expressed in Speech, Serdar Yildirim, Murtaza Bulut, Chul Min Lee, Abe Kazemzadeh, Carlos Busso, Zhigang Deng, Sungbok Lee, Shrikanth Narayanan Proc. International Conference on Spoken Language Processing (ICSLP) 2004, Jeju Island, Korean, Oct 2004, pp. 2193-2196. • Emotion Recognition based on Phoneme Classes, Chul Min Lee, Serdar Yildirim, Murtaza Bulut, Abe Kazemzadeh, Carlos Busso, Zhigang Deng, Sungbok Lee, Shrikanth Narayanan Proc. International Conference on Spoken Language Processing (ICSLP) 2004, Jeju Island, Korean, Oct 2004, pp. 889-892. • Practical Eye Movement Model using Texture Synthesis, Zhigang Deng, JP Lewis, Ulrich Neumann, Proc. ACM SIGGRAPH Sketches and Application 2003, San Diego, CA, August 2003. • One-shot Learning for Human Action Recognition, Hao Jiang, Zhigang Deng, Sijia Wang, Chang Gao, Chengyi Wei and Zhaoqi Wang, ACM SIGGRAPH Symposium on Interactive 3D Graphics and Games 2018, Research Poster, Montreal, Quebec, Canada, May 2018. • Aperture Ratio Influences Action Boundary Perception Accuracy Performance, C. Connaboy, C.D. Johnson, A.D. LaGoy, G-J. Pepping, R.J. Simpson, Z. Deng, L. Ma(s), J. Bower, C.A. Alfano, NASA 2018 Human Research Program (HRP) Meeting, Conference Abstract, Galveston, TX, Jan 2018. • Sleep Deprivation May Influence Overall Performance in An Affordance-based Task, A.M. Sinnott, C. Connaboy, A.D. LaGoy, G-J Pepping, R.J. Simpson, Z. Deng, L. Ma(s), J.L. Bower, C.A. Alfano, NASA 2018 Human Research Program (HRP) Meeting, Conference Abstract, Galveston, TX, Jan 2018. • Cost-based Workload Balancing for Ray Tracing on Multi-GPU Systems, Mario Rincon* and Zhigang Deng, ACM SIGGRAPH 2013 Research Poster, Anaheim, CA, July 2013. • 3D Human Face Identity Transfer Using Deformation Gradient, Tanasai Sucontphunt, Zhigang Deng, and Ulrich Neumann, ACM SIGGRAPH 2010 Research Poster, Los Angeles, CA, July 2010. • A Method for Planning Interventions in the Brain with Straight Access Paths, Nikhil Navkar*, Nikolaos V. Tsekos, Jason Stafford, Jeffrey Weinberg, and Zhigang Deng. Conference Abstract 7162, International Society for Magnetic Resonance in Medicine (ISMRM) 2010 Annual Meeting, Stockholm, Sweden, 2010. • An Approach for MRI based Pre-operative Planning of Cardiac Interventions via Trans-apical Access, Erol Yeniaras, Nikhil Navkar*, Zhigang Deng, Mushabbar A. Syed, and Nikolaos V. Tsekos. Conference Abstract 4422, International Society for Magnetic Resonance in Medicine (ISMRM) 2010 Annual Meeting, Stockholm, Sweden, 2010. • Movement Intermittency and Variability in Human Arm Movements, Ozkan Celik, Qin Gu*, Zhigang Deng, Marcia O'Malley, Conference Abstracts, 2009 RSS Hand Worshop: Understanding the Human Hand for Advancing Robotic Manipulation, co-located with Robotics: Sciences and Systems (RSS), Seattle, WA, June 2009. • Coregistration and Visualization of Regional Perfusion from First-Pass Multislice Sets based on Independent Components Analysis, A. Sonmez, J. Milles, Z. Deng, N. V. Tsekos. Conference Abstracts, International Society for Magnetic Resonance in Medicine (ISMRM) 2009 Annual Meeting, Honolulu, USA, April 2009. • A Methodology for Mapping Mental Spaces of Game Gentres, JP Lewis, P. Fox, Z. Deng, Poster, SandBox: ACM SIGGRAPH Symposium on Video Games 2006, Boston, MA, July 2006. • Crowd Behavior Simulation with Emotional Contagion in Unexpected Multi-hazard Situations, Mingliang Xu, Xiaozheng Xie, Pei Lv, Jiangwei Niu, Hua Wang, Chaochao Li, Ruijie Zhu, Zhigang Deng, Bing Zhou, arXiv preprint, arXiv:1801.10000, Jan 2018. • Crowd Simulation Model Integrating ``Physiology-Psychology-Physics" Factors, Mingliang Xu, Chaochao Li, Pei Lv, Wei Chen, Dinesh Manocha, Zhigang Deng, Bing Zhou, arXiv preprint, arXiv:1801.00216, Dec 2017. • A Visual Analytic System for Longitudinal Transportation Data of Great Britain, Marzieh Berenjkoub, Harsha Nyshadham*, Zhigang Deng, and Guoning Chen. Computer Science Technical Report UH-CS-15-01, University of Houston, July 2015. • Improving Energy Efficiency of GPU based General-Purpose Scientific Computing through Automated Selection of Near Optimal Configurations, Xiaohan Ma*, Mario Rincon*, and Zhigang Deng. Computer Science Technical Report UH-CS-11-08, University of Houston, Oct 2011. • A Global Spatial Similarity Optimization Scheme to Track Large Numbers of Dendritic Spines in Time-lapse Confocal Microscopy, Qing Li*, Zhigang Deng, Yong Zhang, Xiaobo Zhou, U. Valentin Nagerl, and Stephen TC Wong. Computer Science Technical Report UH-CS-10-11, University of Houston, Oct 2010. • Context-Aware Motion Diversification for Crowd Simulation, Qin Gu* and Zhigang Deng. Computer Science Technical Report UH-CS-10-01, University of Houston, Feb 2010. • Image-based Face Illumination Transferring using Logarithmic Total Variation Models, Qing Li*, Wotao Yin, Zhigang Deng. Computer Science Technical Report UH-CS-09-06, University of Houston, May 2009. • Can Local Avatars Satisfy Global Audience? A Case Study of High-Fidelity 3D Facial Avatar Animation in Subject Identification and Emotion Perception by US and International Groups, Chang Yun*, Zhigang Deng, Merill Hiscock. Computer Science Technical Report UH-CS-09-05, University of Houston, March 2009. • Compression of Human Motion Capture Data Using Motion Pattern Indexing, Qin Gu*, Jingliang Peng, Zhigang Deng. Computer Science Technical Report UH-CS-08-13, University of Houston, September 2008. • Expressive Speech Animation Synthesis with Phoneme-Level Controls, Zhigang Deng, Ulrich Neumann. Computer Science Technical Report UH-CS-08-05, University of Houston, April 2008. • Facial Motion Capture Editing by Automated Orthogonal Blendshape Construction and Weight Propagation, Qing Li*, Zhigang Deng. Computer Science Technical Report UH-CS-07-12, University of Houston, October 2007. • Online Motion Capture Marker Labeling for Multiple Interacting Articulated Targets, Qian Yu, Qing Li*, Zhigang Deng. Computer Science Technical Report UH-CS-07-11, University of Houston, September 2007. • Data-Driven Facial Animation Synthesis by Learning From Facial Motion Capture Data, Zhigang Deng. Doctoral Dissertation, University of Southern California, May 2006. • Design of 2D Vector Animation Algorithms for Hypermedia Authoring Systems, Zhigang Deng. Master Thesis, Peking University, China, June 2000. University of Texas MD Anderson Cancer Center, Houston, TX. ACM SIGGRAPH 2014, Vancouver, BC, Canada. Institute of Computing Technology, Chinese Academy of Science, China. Department of ECE, University of Houston, TX. Northwestern Polytechnic University, Xi'an, China. Qualcomm Research, San Diego, CA. Banff 2011 International Workshop on "Geometry for Anatomy", Alberta, Canada. CHI 2011 Conference, Vancouver, Canada. SHARP Research Lab of America, Camas, WA. IBM Alameden Research Center, San Jose, CA. Nokia Research Center, Palo Alto, CA. IEEE Virtual Reality Conference. Lafayette, LA. ACM SIGGRAPH Symp. on Interactive 3D Graphics and Games, Boston, MA. ACM SIGGRAPH/EG Symposium on Computer Animation, Dublin, Ireland. Graphics Interface Conference, Windsor, Ontario, Canada. Academy for Science & Health Professions, Houston, TX. Eurographics 2007 Conference, Prague, Czech Republic. Institute of Automation, Chinese Academy of Sciences, Beijing, China. Beijing Institute of Technology, Beijing, China. University of Texas at Dallas, Dallas, TX. Intelligent Virtual Agents Conference, Marina Del Rey, CA. ACM SIGGRAPH Symp. on Interactive 3D Graphics, Redwood, CA. Computer Graphics International Conference, Stony Brook, NY. First Annual USC Graphics Symp, University of Southern California. Annual IMSC Student Conference, University of Southern California. IMSC Lecture Series, University of Southern California. User Interface Technology Symp, IBM Watson Research Center, NY. ACM SIGGRAPH 2003, San Diego, CA. Walt-Disney Feature Animation, Burbank, CA. Steering Committee Member, Computer Graphics Society, 2016 - 2019. Steering Committee Member, ACM SIGGRAPH/Eurographics Symposium on Computer Animation, 2015 - 2020. Steering Committee Member, International Chinese Association of Human Computer Interaction, 2012 - 2014. General Chair, IEEE International Conference on Computer Science & Education 2017, Houston. General Co-Chair, ACM SIGGRAPH/Eurographics Symposium on Computer Animation (SCA) 2015, Los Angeles. Program Co-Chair (Computer Graphics Area), International Symposium on Visual Computing 2014, Las Vegas. General Co-Chair, International Conference on Computer Animation and Social Agents (CASA) 2014, Houston. Panel co-Chair, First International Symposium on Chinese HCI 2013 (co-located with CHI 2013), Paris, France. General Chair, TexGraph Conference 2008, Houston, Texas. * First employment: Research Scientist, NetEase, China. PhD Dissertation: "Towards High Quality Hexahedral Meshes: Generation, Optimization, and Evaluation"
* First employment: PostDoc Researcher, New York University ==> Assistant Professor, Florida State University, USA. PhD Dissertation: "Example-based Rigging and Real-time Animation of Characters with Linear Skinning Models"
* First employment: PostDoc Researcher, Disney Research Pittsburgh ==> Senior Research Scientist, Electronic Arts SEED Research Lab, USA. PhD Dissertation: "Visual Force-Feedback Interfacing for Image-Guided Telemanipulated Robotic Surgical System"
* First employment: R&D Executive, Qatar Robotic Surgery Center ==> Academic Research Scientist, Hamad Medical, Qatar. PhD Dissertation: "Perceptual Analysis and Modeling of Facial Animation"
* First employment: AMD ==> Co-Founder/CEO, Accelo.ai, USA. PhD Dissertation: "Algorithms for Dendritic Spine Detection and Tracking in Time-Lapse Microscopy Neuron Images"
PhD Dissertation: "Agent-based Approaches for Stylizing Motion Variations and Formations in Crowd Simulation"
Chang Yun (University of Houston, PhD co-advisors: Z. Deng and O. Johnson), PhD Dissertation defended in May 2009. PhD Dissertation: "Improving Gaming Experience Using Real-Time, Adaptive Game Difficulty Adjustments by Utilizing Physiological Feedback"
* First employment: Instructional Assistant Professor, University of Houston==> Instructional Associate Professor, University of Houston, USA. MSc Thesis: "Academia Arcana: A Gamified and Game-based Review Tool." * First employment: Software Engineer, Cerner Company, USA. MSc Thesis: "Nightmare Runner: A Personalized Avatar and Physical Activity Game." Cheng Chen (University of Houston), April 2014. MSc Thesis: "Avatar Creation and Customization for Health Games." * First employment: Game Software Engineer, Midnight Game Studio ==> Google, USA. Xiao Cheng (University of Houston), November 2013. MSc Thesis: "GPU-accelerated Crowd Simulation with User-Guidance and Multi-level Uncertainty." * First employment: Software Engineer, CGGVeritas ==> Schlumberger, USA. Harsha Nyshadham (University of Houston), July 2013. MSc Thesis: "Visual Comparison Models for Transportation Data of the Great Britain." * First employment: Software Engineer, Ford Motor Company, USA. Chrysanthi Chaleva Ntina (University of Houston), April 2013. MSc Thesis: "Stereo Calibration of Depth Sensors with 3D Correspondences and Smooth Interpolants." * Best MSc Thesis Student Award (UH CS Department), 2013. * First employment: Software Engineer, Catalina Marketing ==> TripAdvisor, USA. Mario Rincon (University of Houston), Nov 2011. MSc Thesis: "Cost-based Workload Balancing for Ray Tracing on a Heterogeneous Platform." * First employment: Senior Software Engineer, Nokia, Germany. Michael R. Jahn (University of Houston), April 2011. MSc Thesis: "Real time Human Animation Control Using Tri-Axis Accelerometers"
* First employment: Software Engineer, TimeGate Game Studios ==> Terrific Studios, USA. Nikhil Navkar (University of Houston), Oct 2009. MSc Thesis: "Virtual Environment for Planning Surgical Incision with Straight Access"
* First employment: Continue PhD study at UH. Qing Li (University of Houston), Nov 2008. MSc Thesis: "Facial Motion Capture Editing by Automated Orthogonal Blendshape Construction and Weight Propagation"
Qin Gu (University of Houston), April 2008. MSc Thesis: "Compression of Human Motion Capture Data Using Motion Pattern Indexing Technology"
Yuting Zhang (University of Houston), Dec 2018. * First employment: Software Engineer, Expedia Group, USA. 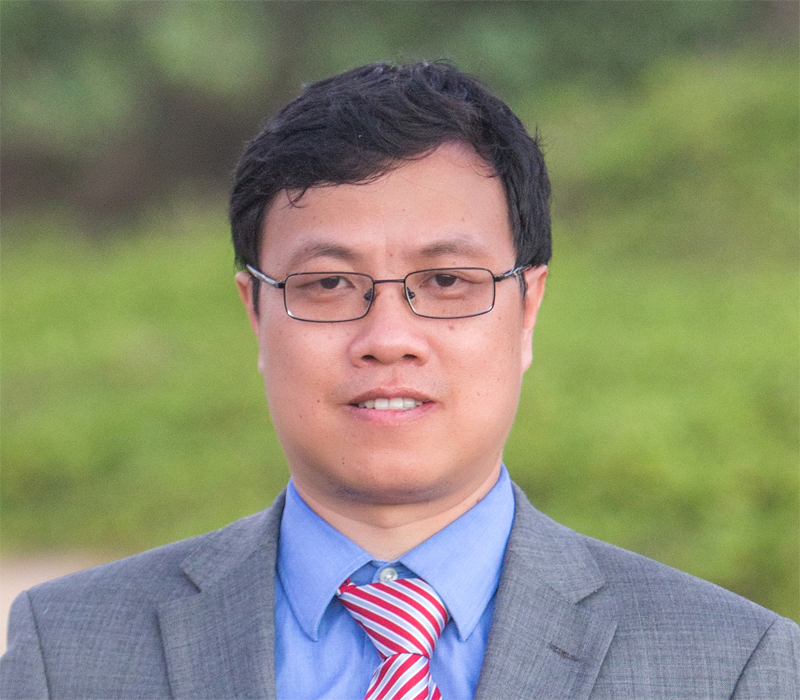 Mingxuan Luo (University of Houston), May 2018. * First employment: IT Engineer, Zhengzhou University, China. Tanay Bhargava (University of Houston), May 2015. * First employment: Software Engineer, Amazon, USA. Yen Le Hai (University of Houston), PhD thesis defended in April 2014. Wei Ding (University of Houston), PhD thesis defended in May 2013. Ahmet Sonmez (University of Houston), PhD thesis defended in 2012. Francisco Ocegueda-Hernandez (University of Houston), PhD thesis defended in 2012. Erol Yeniaras (University of Houston), PhD thesis defended in April 2011. Yuichi Fujiki (University of Houston), PhD thesis defended in April 2011. Raja Kushalnagar (University of Houston), PhD thesis defended in Nov 2010. Rachsuda Jiamthapthaksin (University of Houston), PhD thesis defended in July 2009. George Toderici (University of Houston), PhD thesis defended in Nov 2007. Shuyu Xu (University of Houston), MS thesis defended in April 2014. Wei Cao (University of Houston), MS thesis defended in Nov 2013. Walid Elkour (University of Houston), MS thesis defended in April 2012. Prerana Chitlangia (University of Houston), MS thesis defended in Nov 2011. Shaunak Vairagare (University of Houston), MS thesis defended in Nov 2011. Amrita Banerjee (University of Houston), MS thesis defended in Dec 2011. Xin Zhou (University of Houston), Spring 16 - Summer 18. Harold Owens (USMA/ARL Summer Intern), 6/15 -8/15. Erinn Gentry (USMA/ARL Summer Intern), 6/15 -8/15. Ashley Balkum (Rice University), NSF REU student, 05/15 - 7/15. Richard Giliam (University of Houston), NSF REU student, 9/10-5/11. Reuben Rodriguez (University of Houston-Downtown), AGEP undergrad student, summer/08. UH professor sees into the future of human-computer interaction. Daily Cougars, April 11st, 2017. UH professor sees into the future of human-computer interaction. UWire.com, April 11st, 2017. Quantifying Eye Contact During Conversations. UH College of Natural Sciences and Mathematics News, March 2nd, 2017. UH Computer Graphics Research: New Method Automates Skeletal Design for Character Animation. UH Department of Computer Science News, July 7th, 2014. NIH Grant Supports Design of Video Games to Promote Physical Activity in Youth. Breakthrough (NSM Newsletter for alumni and friends), Fall/Winter 2013. Augmented reality turns animation into oil business tool. Fuelfix.com (a daily news service website for energy business). NSM Faculty Honored at UH Evening of Faculty Excellence. UH NSM News (News of UH College of Natural Sciences and Mathematics). Contest develops mobile prototype. The Daily Cougar Newspaper. Medical Robotics to Improve Heart Surgery. Scentific Computing News. Medical Robotics to Improve Heart Surgery. The University of Houston News. Game Papers: A Convergence of Science and Art. SIGGRAPH 2010 Conference Newsletter. Students Design Video Games to Aid in Recycling, Pollution Control. UH University News. UH awarded $2.5 million for research. The Daily Cougars. Research Nets $2.5 Million in Grants For UH Professors. University of Houston News. Computer Science Students Among International Gaming Finalists. UH NSM Breakthrough. New Class Lets Students Develop Video Games. UH NSM Breakthrough. Open House Presents Computer Science Exciting High-Tech Projects. UH College of Natural Sciences and Mathematics Communications. Researchers Develop New Eye-Animation Method. NSF Engineering Research Center (ERC) Research Achievement Showcase. Eye-Motion Commotion. USC Engineer Magazine.